What is the “Certificate of Irish Heritage” ? This is an Irish government initiative aimed at strengthening the links between Ireland and the Irish diaspora. 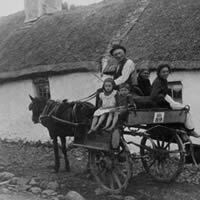 The scheme aims to offer descendants of Irish emigrants official recognition of their origins and links to Ireland. If you are not entitled to full Irish citizenship, this certificate is a way of honouring those ancestors who left these shores many years ago. See the Irish government’s website on this certificate here. Some famous people from all around the world and from all walks of life have honoured their Irish family ties with the “Certificate of Irish Heritage”. These include the likes of Malia & Sasha Obama, President Bill Clinton and actor Tom Cruise. To complete this process, you will need to supply some documents as evidence of your Irish ancestry – to get started, we can help you with a free assessment of your Irish family history and aid in securing a “Certificate of Irish Heritage”.